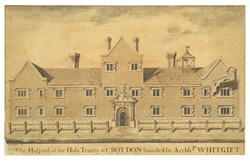 The parish of Croydon received donations from successive archbishops of Canterbury who held a summer house here. The Whitgift's hospital was founded by Archbishop Whitgift and built in 1596-9. The building has a red-brick, symmetrical street front with three gables. Inside the gate is a quadrangle. Daniel Defoe noted in the 18th century that: "it is the antient palace of Archbishops of Canterbury, and several of them lye buried here; particularly that great man, Archbishop Whitgift, who not only repair'd the palace, but built the famous hospital and school."